And young people, remember. If you’re fortunate enough today to have a daddy and a mother living, love them, honor them. The hour will come when you’ll think they’re the greatest people in the world, if you don’t now. And don’t never, little fellows, don’t never give this slandering word, “old man,” and “old woman.” That’s not the old man and old woman. That’s daddy and mother. 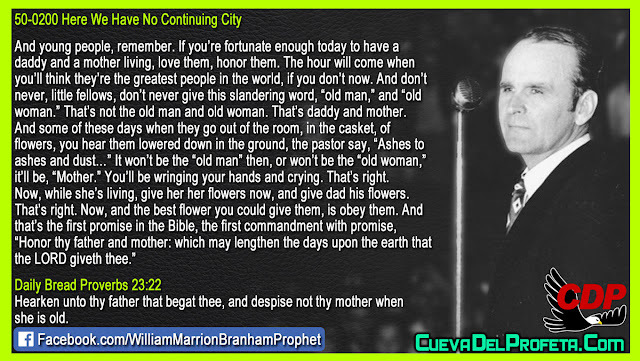 And some of these days when they go out of the room, in the casket, of flowers, you hear them lowered down in the ground, the pastor say, “Ashes to ashes and dust…” It won’t be the “old man” then, or won’t be the “old woman,” it’ll be, “Mother.” You’ll be wringing your hands and crying. That’s right. Hearken unto thy father that begat thee, and despise not thy mother when she is old.